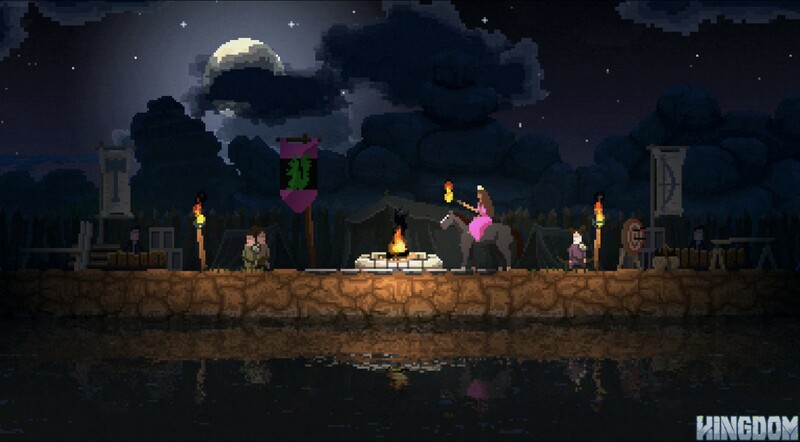 REVIEW - Kingdom - Use a Potion! Everyone wants to be King, right? Rule over a kingdom, have peasants bow to your feet, command an army of knights – all this whilst getting to sit on your throne all day with a golden, jewelled crown on your head. It’s good to be King. 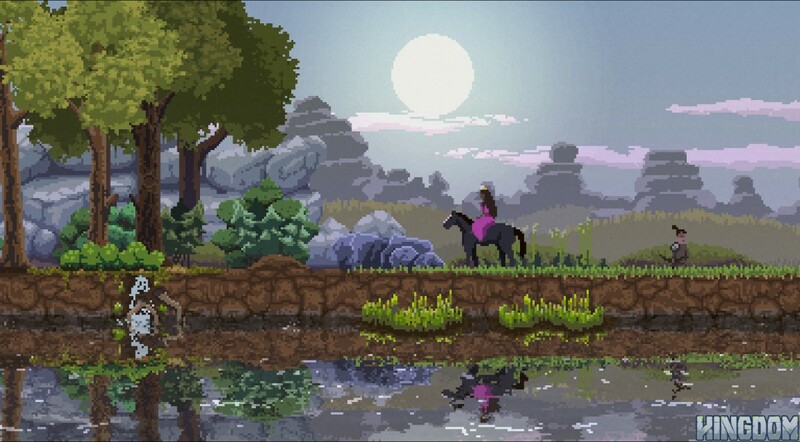 Kingdom opens with very little narrative; just a randomly generated King (or Queen – it’s random) riding on horseback into a randomly generated 2D land. It’s simple, but that simple approach is carried on through the gameplay – despite the depth that Kingdom offers, every aspect of the game is generally managed through the use of one button. As you start the game and approach the land, you’ll see a stone carving of the game’s title crumble as you pass it; it’s almost poetic, seeing as most of the game is spent watching your kingdom fall apart. Kingdom is tough, but it’s not unfair. Its simplistic approach means that it’s easy to play but difficult to master. Upon arrival in the land, you’re equipped with just your crown and a few gold pieces. These gold pieces can be used to build the foundation of your kingdom. From there you need men; the land is littered with campsites from which you can find new recruits, each offering their service for a mere gold piece. You’ll have to allocate roles to these recruits – starting with builders who will develop your kingdom with defences and archers who’ll be doing the defending whilst also hunting animals to earn you some extra income. Each job requires a set amount of gold pieces to allocate, so you have to decide which role you want to focus on – it’s these decisions that will determine if your kingdom will be glorious or will simply crumble in front of you. 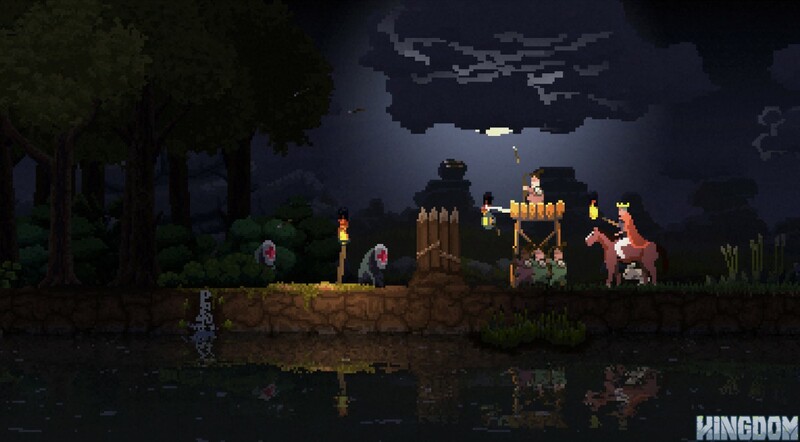 Kingdom has a vicious day and night cycle that has you spending the day developing your kingdom, finding new recruits and exploring the land whilst night time is spent defending it from an onslaught of trolls. To defend, you’ll need to surround your kingdom in walls and have archers shoot down any on-coming trolls – failure to protect your kingdom comes with dire consequences, with tools and gold being stolen. If you’re really unfortunate, your crown can be stolen too resulting in an instant game over. You’ll constantly need to improve your defences throughout the game, with enemy onslaughts getting stronger as the game progresses. This is where your decision making skills are vital; do you prioritise on your defence and spend your gold on builders and walls, or do you instead focus on equipping your men with bows and take a more offensive approach. Each decision you make will determine the success of your kingdom. You’ll begin to dread nightfall, but when you do survive and see the dawn of a new day there’s a huge feeling of satisfaction. Each day unlocks new upgrades as well as offering you a treasure chest full of gold coins to help expand your kingdom – the longer you’re able to survive the stronger your kingdom can become. Of course, to counter-balance your progress is the constant strengthening of the enemy forces. Whilst the game teaches you the basics, you will need to learn everything else yourself; there’s no hand holding in Kingdom. As you venture through the lands you’ll find landmarks to claim at the expense of a few gold coins, but don’t expect to be told what they do. You’ll also discover the portals from which the trolls appear, but there’s no indication of how you can destroy them. Whilst this may be intimidating at first, it’s part of what makes Kingdom such an enticing experience to play – knowledge comes with progress, so you’ll want to keep playing. However, progress is difficult seeing how you’ll find yourself facing failure on such a regular basis. My first attempt at Kingdom lasted two days – after a fairly successful first defence of my kingdom, I ventured out into the land seeking new landmarks and gold. 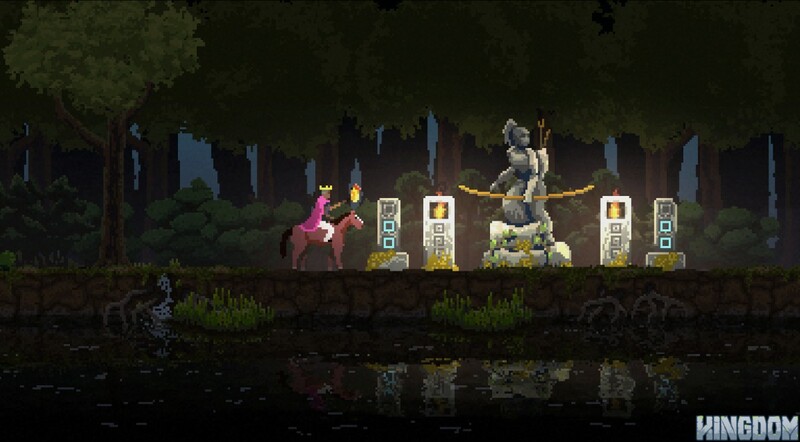 Instead, I ended up getting ambushed by trolls and having my crown stolen – you can’t be king without a crown. Thus, I started again in a new randomly generated land with all new discoveries to make – each time you start again everything is different. This time I had the knowledge that I had to be more careful when exploring. I lasted four days – my failure came due to a severe lack of archers to protect my kingdom. With each failure you’re constantly learning how to improve your next kingdom – it’s the first game I’ve played where there is some bizarre satisfaction to be taken from each loss. That’s not to say failure isn’t frustrating though. Whilst the game isn’t unfair, you can spend a lot of time building up a Kingdom only to see it fall apart due to one silly error. I’d spent a long time expanding my Kingdom, surviving numerous attacks and seeing an army of knights begin to grow only to lose it all due to one botched defence. You can’t help to feel it’s not your fault at times too, with the accuracy of your archers sometimes resembling that of a misfiring Stormtrooper. Yet, with each failure you’ll keep playing. You’ll keep telling yourself you can do better the next time around, and you usually do. 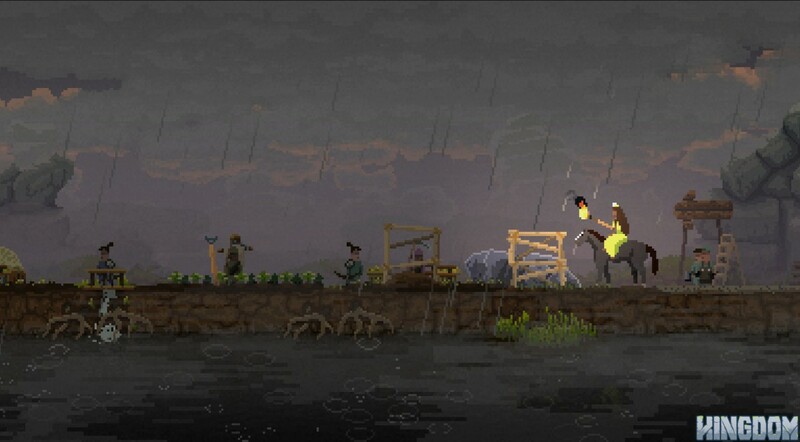 Kingdom really hooks you in with its addictive gameplay and you’ll lose hours to it – even if those hours are spent watching hard work go to waste. Unfortunately, with the ‘try again’ nature of the game you do feel like you’re constantly doing the same thing over and over again. The early days of Kingdom feel the same across playthroughs, and with the constant re-trying it sometimes suffers with a lack of variety. Whilst the difficulty of Kingdom can be hellish, its presentation is far from it. From the bustling woods full of wildlife to the reflections in the river that runs alongside your kingdom – there’s so much attention to detail with the graphics and it looks outstanding. There’s also a variety of weather effects changing things up; sometimes there’ll be mist floating through your kingdom obscuring your view whilst other times it’ll be rainfall beating down on you, causing splashes within the river. The sky is constantly changing too – you’ll want to watch out for the dreaded blood moon. 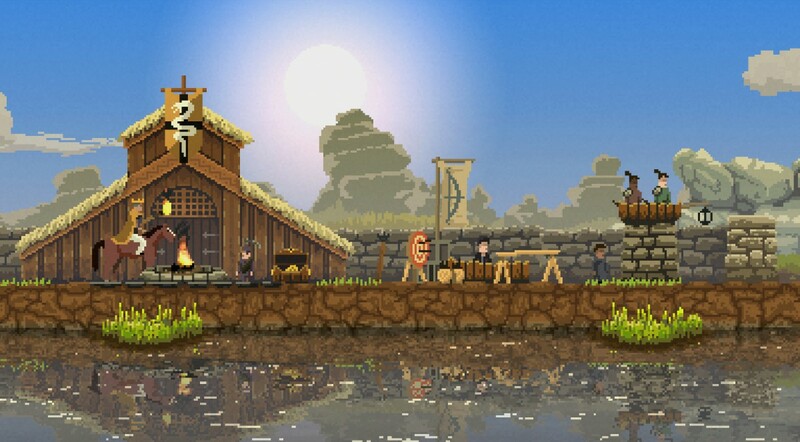 I’m a huge fan of pixel art so I could appreciate Kingdom’s style. Whilst there isn’t a lot of variety in the environments, it always looks fantastic. The same attention for detail has been shown in the sound design of the game too. Every piece fits in with the tone of the game – from grand pieces enticing a sense of adventure as you explore the lands to sombre, melancholic pieces as you watch your kingdom get torn apart by a troll attack. There always seems to be appropriate music playing for each situation – it’s constantly changing and you never get bored of it. There’s also times when there’s no music but instead ambient noises; again, this is very effective with setting the tone of the game. A lot of care and attention has gone into the sound design and it’s really paid off. Kingdom has such a simple concept but it has a lot of depth. There’s a lot of careful planning required to achieve success; something I haven’t managed during my time with the game. You’re constantly being tested with challenging difficulty, but each failure comes with a sense of progress. It’s tricky, a little frustrating and at times repetitive – it’s such so damn addictive.